Artificial Tears | Visionary Eyecare's Blog: "The Eye Journal"
Do you think that you may have Dry Eye?? Do you have a lot of burning in your eyes? Do you have a lot of tearing in your eyes? Do you experience a lot of itching in your eyes? Do your eyes feel like there is something in them – like an eyelash or hair – even when there is not? Do your eyes feel sandy or gritty? Does your vision intermittently blur and when you blink it clears up? Do you do a lot of work at a computer? Do you do a lot of reading? Do you do a lot of work outdoors? If you answered YES to any of the questions above – then you may have Dry Eye. Click on the “DRY EYE TEST” at the top of this post to help to determine if you do have dry eye. If you DO have dry eye or answered YES to any of the questions in the above list – schedule an appointment to see your eye doctor. Your eye doctor can help determine what treatment, if any, is best for you. Common treatments can include using artificial tears in your eyes frequently throughout the day, fish oil capsules or eye vitamins or capsules to be taken orally, punctal plugs to be inserted or a prescription for a medication like Restasis that can help you produce more tears. There are several treatments for Dry Eye including using artificial tears, prescription eye drop medications like Restasis, eating a diet that is rich in Omega 3 fatty acids (salmon, fish oil supplement capsules or flaxseed oil) and punctal plugs. Dry eyes are very common problem for many people. Symptoms of dry eyes can include burning, dry eye feeling, itching, intermittent vision blur (that clears up when you blink) and excess tearing (the brain’s natural response to eye dryness). Punctal plugs are used when you are producing very little tear fluid to properly bathe your eyes. The plugs are inserted into your puncta (the opening of your tear drainage duct) to help preserve what little tears that you do have. Punctal plugs keep your tears ON the surface of your eye (instead of draining out the drainage duct). The procedure is quick and painless and can be done right in the office examination room. The plugs are inserted painlessly in our office in about 5 minutes. There are 2 types of plugs – collagen (disolvable) and silicone (non-disolvable – but still removable if you ever want them removed). At Visionary eyecare we usually insert collagen (disolvable ) plugs into the lower puncta of each eye as a trial test. The plugs will usually last for 3-5 days. In about a week, we will bring you back for a follow up. If you are happy with the amount of moisture in your eyes at your follow up – then we proceed to insert the silicone (non-disolvable) plugs into your lower puncta. If you feel that you would like more moisture – then we will insert the collagen (disolvable) plugs into your upper AND lower puncta and bring you back for a follow up in about a week. 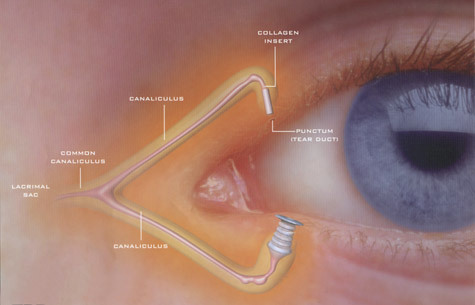 If you are happy with the amount of moisture then we will proceed to insert the silicone (non-disolvable) plugs into all 4 puncta (the upper and lower puncta in each eye). These plugs can also be called Lacrimal Plugs….and they are NOT felt once they are inserted into your punctas. The Picture Above shows a Collagen Plug in the Upper Puncta and a Silicone Plug in the Lower Puncta. Join Now To Get Cash Back for Shopping Online at Major Retailers!! Online Eye Test: Find Your Blind Spot in Each Eye! Carol Marsh-Urquhart (at Visionary Eyecare in Pembroke Pines) Helps a Local Child in Need…In More Ways Than One! Win a FREE IPod during our Patient Appreciation Event at our Sawgrass Mills Mall / Sunrise Location – Nov 13, 14, 15th ! Video – Description of Cataracts. What Are Cataracts? Happy Birthday Dr Emily McCulloh !